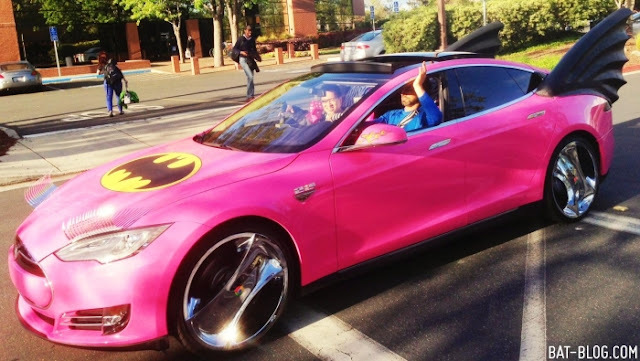 BAT - BLOG : BATMAN TOYS and COLLECTIBLES: Google co-founder Sergey Brin Drives a Batman Batmobile Car!! Google co-founder Sergey Brin Drives a Batman Batmobile Car!! 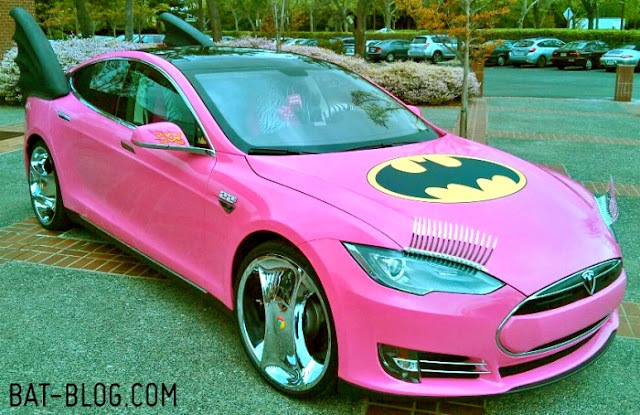 On April Fool's day some employees of Google customized co-founder Sergey Brin's Tesla Model S and had it customized like a Batman Batmobile. Well, sort of... his car was painted HOT PINK with a Huge Bat-Symbol Logo on the hood! It also sports some awesome Tail Fins and the headlights were given girlie-style eyelashes! Well, I guess he has a pretty good sense of humor because the photo down below shows him driving it away, ha!